"Too Soon For A Deal": All You Need To Know About "The Most Important Trump-Xi Meeting In Years"
“Too Soon For A Deal”: All You Need To Know About “The Most Important Trump-Xi Meeting In Years” 5 out of 5 based on 1 ratings. 1 user reviews. With the United States and China locked in growing disputes over trade and security that have raised questions about the future of their relationship, presidents Trump and Xi are due to sit down for dinner at the end of a two-day gathering of G-20 world leaders in Buenos Aires. The highly anticipated meeting between the two superpower leaders, which is expected to be the defining market moving event for the last month of the year, will wrap up a global summit on Saturday with high-stakes talks expected to determine whether they can begin defusing a damaging trade war between the world’s two biggest economies. On Friday, the market bounced hard into the close after the first day of the G20 summit offered glimmers of hope for progress between Washington and Beijing despite Trump’s earlier threat of new tariffs, which would increase tensions already weighing on global financial markets. But on the eve of what Reuters dubs “the most important meeting of U.S. and Chinese leaders in years“, both sides said differences remained, and the outcome of the talks were uncertain. The first, and less important one, has to do with whether the G20 summit will conclude with a consensus statement as delegates from G20 nations worked late into the night to seek agreement on the summit’s final communique, which in past years has been worked out well in advance. According to Reuters, European officials said on Saturday that a draft of the document committed to reforming the World Trade Organization (WTO), which has been engulfed in institutional crisis just when it is most needed to perform its role as umpire in trade disputes. They said the draft also included a reference to climate change – a sensitive issue for Trump, who is a skeptic that global warming is caused by human activity. The communique needs to be endorsed by the leaders of member states. In previewing the odds of a favorable outcome, Trump was typically coy on Friday even as he noted some positive signs. The market then rallied hard into the close when a Chinese foreign ministry official in Buenos Aires said there were signs of increasing consensus ahead of the discussions but that differences persisted. Beijing hopes to persuade Trump to abandon plans to hike tariffs on $200 billion of Chinese goods to 25% in January, from 10% at present. To date, roughly $250 billion in goods from China and $110 billion in goods from the US have been subject to additional tariffs, and further tariffs have been threatened. Trump has threatened to go ahead with that and possibly add tariffs on $267 billion of imports if there is no progress in the talks. As shown in the chart below, for much of 2018 the Trump Administration’s proposal of new tariffs far outpaced actual implementation. By July, the Administration had proposed tariffs on solar panels and washing machines ($10bn), global steel and aluminum imports ($50bn), global automobile imports ($340bn), and all imports of goods from China ($500bn). From June through August, the amount of imports subject to tariffs ratcheted up very gradually, and it was not until September 24 – when the US imposed tariffs on $200bn in imports from China – that the amount rose more substantially. The effect of these tariffs has been evident in customs receipts, which have risen substantially over the last few months, something which Trump has repeatedly touted as a fringe benefit of the escalating trade war. A deal (10% chance). Talks have been taking place for a few weeks at lower levels, and it is possible that Presidents Trump and Xi could agree on a set of specific concessions on both sides. For example, President Trump could agree to lift tariffs on certain Chinese exports and to halt further tariffs in return for a commitment from President Xi to ensure greater purchases of US exports and liberalize various policies. This sort of deal could ultimately be struck, but we are skeptical that it will be struck now. A truce (just under 40% chance). Since dialogue only restarted recently, a more likely outcome than an outright “deal” would be a truce where the US refrains from imposing additional tariffs for the time being (i.e., postponement of the 25% step-up in tariff rate and no new tariffs on additional goods) and China commits to quickly propose a set of reforms, perhaps along with a down payment on a deal such as a commitment to increase purchases of certain US commodity exports. This does not strike us as the most likely scenario, but it certainly appears to be a possibility. Further escalation (just over 50% chance). We think it is slightly more likely that the talks end with an optimistic tone but that there is no immediate commitment to delay the step-up in the tariff rate to 25%. That said, we view this as a reasonably close call. Goldman acknowledges that it is “somewhat less optimistic than the consensus view regarding the prospects for a near-term “deal” or truce” for three general reasons. First, for as much as financial markets and affected industries might cheer a truce in the trade dispute, there is fairly broad political support—among the public and among members of Congress—for taking a tough stance on US-China trade issues. We note, for example, comments from Senate Minority Leader Schumer and Senate Finance Committee Ranking Member Wyden urging the President not to “back down” and accept a “weak and meaningless agreement” at the G20 meeting. Second, reaching an agreement could be technically challenging. We do not believe there has been sufficient groundwork ahead of the meeting to allow for any sort of specific agreement at the G20. This would make reaching a “deal” scenario as outlined above difficult. Without a specific and enforceable agreement in hand, it is also unclear whether the White House would be willing to reverse the planned step-up in the tariff rate to 25%. Third, this might not be a politically opportune time for an agreement. While some observers argue that President Trump might ultimately agree to a deal with China that results in only modest policy changes (as was the case with the US-Mexico-Canada Agreement) or involves a promise to hold off on additional tariffs in return for a commitment to negotiate (as was the case earlier this year with the EU on auto tariffs) we note that both of these examples occurred shortly before the midterm election, when announcing “wins” on trade policy carried larger political advantages. The political benefits of any agreement with China struck now would presumably have faded long before the US presidential election in nearly two years. Other banks are somewhat more optimistic, expecting a “truce” base case with a roughly 70% odds, in which as Goldman explained, existing tariffs stay in place, but additional tariffs are taken off the table during the negotiating period. If such a ceasefire lasts at least 3 months, it will be enough to send the S&P to 2,800, or considering the Friday close of 2,760, it is now largely priced in. In addition to trade – which will be the key topic of discussion today – the two countries are also at odds militarily over China’s extensive claims in the South China Sea and U.S. warship movements through the highly sensitive Taiwan Strait, although don’t expect any movement on geopolitical tensions. Additionally, Xi and leaders from the BRICS group of leading emerging economies – Brazil, Russia, India, China and South Africa – called in a statement on Friday for open international trade and a strengthening of the WTO. There were some other awkward moments on Friday: Trump cited Russia’s seizure of Ukrainian ships last week as the reason he canceled a planned bilateral meeting with Russian President Vladimir Putin, who instead warmly greeted Saudi Crown Prince Mohammed bin Salman, and was seated next to him during Friday’s proceedings, with both leaders clearly in good mood. The presence of MbS at the summit also raised an awkward dilemma for leaders, and Saudi Arabia’s de facto leader cut a lonely figure standing at the edge of the G20 family photo on Friday. Intellectual property and technology transfer: This was the primary focus of the Section 301 case that led to the imposition of tariffs earlier this year. Specifically, USTR claimed that ownership restrictions, licensing requirements, acquisition of US cutting-edge technology, and cyber theft put US industries at a disadvantage. As a result, the White House has sought to eliminate various licensing requirements, limit attempts to acquire US technologies and intellectual property, and to cease cyber intrusions that US officials claim have targeted US intellectual property and business information. The US has already announced some unilateral steps on this front, in some cases as a result of legislation. The Committee on Foreign Investment in the US (CFIUS) has implemented a program, effective November 10, which requires certain transactions to be submitted for review if they involve 27 “critical technology” sectors. In addition to explicitly defense-related industries, the list covers computers and computer storage, semiconductors, telecom equipment, biotechnology, nanotechnology, and chemicals. The Department of Commerce has also released a proposal to tighten export controls on “emerging technologies.” The process is in the early stages of identifying industries that where exports could be limited, but the categories of interest include biotechnology, artificial intelligence, robotics, navigation, microprocessors, advanced and quantum computing, logistics technology, 3D printing, and advanced materials. While the details of these unilateral steps might be influenced by the outcome of US-China negotiations over the medium term, these restrictions look likely to take effect in some form. Market access: This appears to be one of the areas where agreement could be somewhat easier. Given that Chinese authorities continue to reduce tariff rates and to narrow the sectors where foreign investment is restricted, we would expect changes in this area to be part of any eventual agreement. The US has requested that China reduce tariffs to US levels in “non-critical” sectors by 2020, and that certain non-tariff barriers must be removed as well. In addition, the White House has singled out market access for US services providers and agricultural goods in its proposal. The US has also sought to eliminate Chinese foreign investment restrictions and ownership requirements, and has sought the publication of a much narrower “negative list” of sectors subject to foreign investment restrictions. Chinese authorities have taken some steps in this direction. Some sectors were removed from the existing “negative list” in July, including: parts of the agriculture and mining sectors, new energy vehicle manufacturing, ship and aircraft manufacturing, electricity infrastructure, gas stations, rail lines, and shipping. Chinese import tariffs (on imports from all countries) have also been reduced twice this year, from an average 16% to 7% on 1449 products in July, with a smaller reduction on 1585 products taking effect November 1. Subsidies: We expect that this would be one of the most difficult aspects of the dispute to resolve and would be surprised if changes in this area were included in any near-term agreement. The US has called on China to eliminate “market-distorting subsidies and other types of government support” of industries targeted by the Made in China 2025 plan. Subsidies are a frequent source of tension in most major trading relationships—the US has engaged in past disputes over subsidies with close allies such as Canada and the EU—but the White House appears to be focused on broader issues related to the structure of China’s economy. Trade deficit: If an agreement is eventually reached, we expect increased Chinese purchases of US goods to be a key component. The White House has sought an agreement to reduce the US-China bilateral trade deficit by $200bn over two years, from a $375bn trade deficit in goods in 2017. $125bn of this reduction would come through additional Chinese purchases of US goods exports. This would roughly double the current level of US exports to China. Earlier this year, an offer by Chinese officials to increase purchases of US exports by $70bn was reported in the press, but no deal was reached. Reaching the numbers the White House has suggested is theoretically possible but would require substantial changes in trade flows. As shown in Exhibit 3, US exports to China represent only 9% of total US exports and 8% of Chinese imports, so doubling US exports to China would require a shift of less than 10% in trade flows of both countries. Of course, this overstates how much could be diverted as US exports are likely to differ in quality, price, seasonal availability, or other characteristics from other countries’ exports, even in the same product category. It also ignores transportation costs, which are an important reason in many cases that US exports to China, and US imports from China, are not greater. Many US exports are also in categories that could be deemed to have strategic relevance to one or both countries. For example, the US exports only one-quarter of semiconductors and semiconductor manufacturing equipment to China, and only 4% of China’s imports of such goods come from the US. However, as noted above, US policies have recently focused on limiting rather than increasing such exports to China. Are Auto Tariffs Back on the Agenda? President Trump has raised the prospect of auto tariffs several times in recent weeks, most recently following General Motors’ announcement that it would close five plants and lay off 15,000 workers. While the threat is not new, further activity on this front could occur soon. White House officials have indicated that the Commerce Department has submitted draft recommendations to the White House on its investigation into whether to impose auto tariffs on national security grounds and media reports have suggested the report could be released publicly as soon as next week. While the timing of this report’s release is uncertain, the Commerce Department must release the report by mid-February 2019, 270 days after the investigation was initiated. The President must then make a decision within 90 days of the report’s release. While the outlook for the auto tariffs is no clearer than the outlook for US-China relations, we continue to believe that the Commerce Department report might recommend tariffs but that the odds that auto tariffs will be implemented are lower than the probability of further tariffs on imports from China. Overall, we believe the odds that the US implements auto tariffs on the EU and Japan are around 35%. Congressional opposition to the tariffs could play a role in dissuading the White House from imposing auto tariffs. The more important factor, in our view, is that the retaliatory tariffs that trading partners could impose in response to auto tariffs would potentially affect more exports than the retaliation imposed by China thus far. Auto imports from the EU and Japan total $110bn, roughly the same as the total amount of US exports to China subject to retaliatory tariffs. It is possible that as much as one-third of US auto imports from Mexico could be subject to tariffs as well, which would raise the total to around $145bn. We expect that most auto imports from Mexico and all imports from Canada would be excluded if tariffs were implemented. We would also note that, because auto tariffs would open up major trade dispute with two new large trading partners, the negative reaction in financial markets could be greater than in the event of further escalation in US-China trade tensions. Evidence of the effects of trade tensions in the economic data is still fairly sparse. Over the past few months, regional manufacturing surveys have reported slightly softer current conditions (Exhibit 5, left), but expectations regarding future conditions have declined somewhat further compared to the period before trade tensions began to escalate earlier this year (Exhibit 5, right). Business surveys and Fed officials continue to raise the potential for uncertainty surrounding trade policy to weigh on economic activity. By contrast, the impact on financial markets has been more noticeable. As our portfolio strategy team has shown, US stocks with a high share of sales in China and Chinese stocks with a higher share of US sales have both underperformed their local indexes. We have estimated that the inflationary effect of the tariffs that we expect to be implemented will peak in June 2019 at 0.17pp boost to year-on-year inflation. This assumes that the 25% step-up in the tariff rate on $200bn in imports from China occurs on schedule on January 1, and that a 10% tariff on the remaining $267bn in imports would be levied in early Q2. Exhibit 8 also shows two upside risk scenarios that we do not assume in our forecast: a 25% rate on the remaining $267bn (rather than the 10% we assume) would raise the peak effect to +0.25pp in September, and a 25% auto tariff on auto imports from the EU, Japan, and roughly 1/3 of auto imports from Mexico would raise the peak effect to +0.32pp. We have estimated that the effects of the measure implemented to date should have a negligible effect on US growth. Even under the scenario where all proposed tariffs are implemented, including autos and further tariffs on imports from China, the effect should be small (around -0.1pp on the level of real GDP after three years) as the boost to growth from a reduction in the trade deficit—this is the effect that reducing trade has for a trade deficit country—is more than offset by the reduction in real household incomes and tighter financial conditions. That said, the potential for a negative equity market reaction presents downside risk to growth beyond our baseline estimate. There will be on deal until the USSA is near total collapse by the end of 2019, so China can get the best terms and win the trade war. Yes the USSA has won the first round of the trade war, which was guaranteed because of their big trade deficit with China. The USSA will lose the second round badly much worse than China lost the first round which is also guaranteed and this will start in 2019. This is because high inflation will hit the USSA once their tariffs fully kick in massively raising prices. As the USSA has a public federal debt alone of over 22 trillion set to increase by 2 to 3 trillion per year, they cannot withstand the higher interest rates, as they will not even be able to pay the interest on their debt. These higher interest rates will be needed to counter hyperinflation from the trade war. So the USSA is going to have hyperinflation like Weimar Germany had which was also run by racist supremacist Jews. The USSA Zio dollar is going to collapse. The USA will lose this trade war because they started it far too late. Many USSA industries have been totally destroyed by Zio Jewish outsourcing to China etc.. Many USSA educational institutions have also been destroyed in the USSA again by Zio racist supremacist Jews. Because of this many USSA industries can’t be replaced / reactivated, once lost to China and even in ones they can reactivate; it will take longer than they have to prevent hyperinflation. In short the USSA has been destroyed by their racist supremacist Jewish slave masters, who have always destroyed every host they have ever had as they always do. 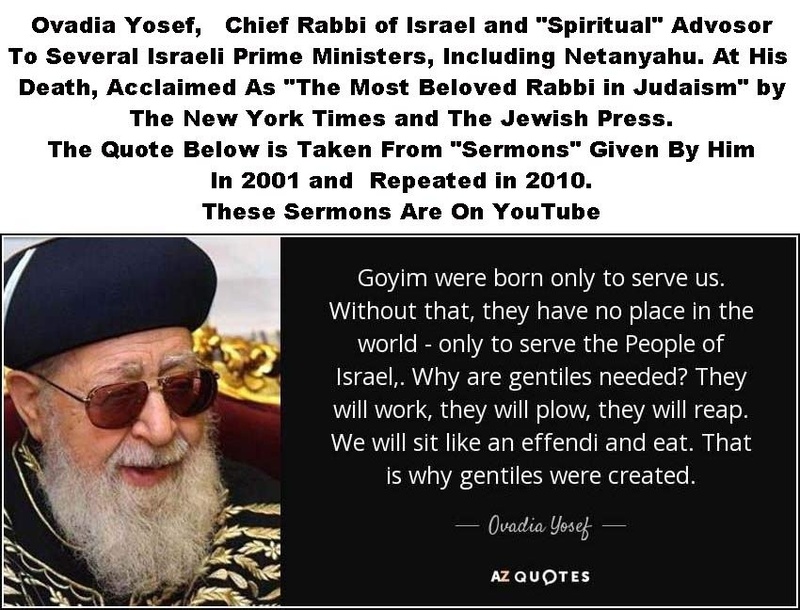 This will lead to the total collapse of the racist supremacist global Jewish confederate slave empire dictatorship and the entire Satanic Jewish world order. I wonder how many more Amercian Goyims racist supremacist Jews will kill before they are overthrown? This seems like another attempt to entrap Trump into the globalist agenda? With all that is on the table that needs to be resolved, why are they sticking this in? ” why are they sticking this in?